Gleneagles Country Club in Lemont, Illinois on Tuesday, July 10, 2018. After dinner, the crowd sang “Happy Birthday” to Rep. Lisa Hernandez and slices of birthday cake was given out. THERE WERE door prizes, a raffle with many gifts and plenty of refreshments for everyone to enjoy. CAEZ is WeCare Labor Consultant, Sonny de Rama is WeCare Regional Vice President of Sales, Ryan McLaughlin is X2F Chicago Executive Director and Joshua Larson is a Montini High School varsity team golfer. SPECIAL GUESTS at the outing were State Sen. Steve Landek, Cicero President Larry Dominick, Cook County Commissioner Jeffrey R. Tobolski and State Rep. Michael J. Zalewski. “LISA” HERNANDEZ, a long-time Cicero community activist, was re-elected and is serving a fifth term as the Democratic State Representative of the 24th District. Lisa is focused on people’s work. She held several immigration workshops. Lisa is presently hosting a Community Shred Day. Please join Lisa on Saturday, July 21, 2018 at L Strip Parking Lot, 2137 South Lombard Avenue in Cicero. For more information call 708/222-5240. REP. HERNANDEZ’s district includes a sliver of Riverside bounded by Herrick on the north and Gage on the south and includes much of the southern half of Brookfield. The district also stretches from Chicago’s Little Village neighborhood to Brookfield. 15th Annual “Bike the 30th Ward” starting from Kilbourn Park, 3501 N. Kilbourn Ave. to Riis Park and returning to Kilbourn Park. This is a police force escorted family ride. For more information call the 30th Ward office at 773/794-3095. ARIEL REBOYRAS is a council member of the 30th ward in the City of Chicago. 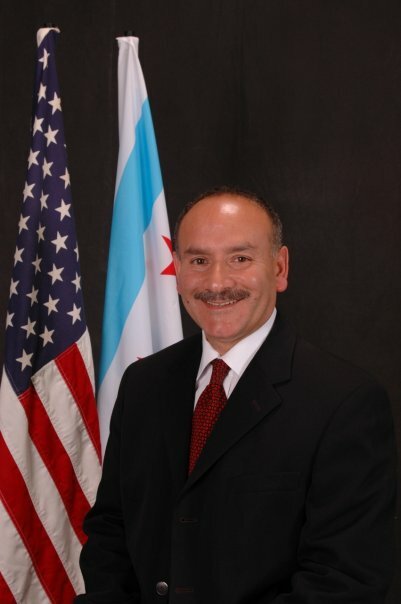 He was first elected in 2003 and prior to becoming the Alderman; Reboyras was a Deputy Commissioner in the City’s Department of General Services. ARIEL Reboyras was born in New York City in 1953 of Puerto Rican descent. He moved to Chicago with his parents at the age of twelve. Reboyras attended the University of Illinois at Chicago where he was Co-Captain for the UIC Flames baseball team. After graduating with a Bachelor of Arts degree in Education, he taught at Roberto Clemente High School in Chicago's neighborhood of Humboldt Park. ALD. REBOYRAS he serves on five committees as a member of the Chicago City Council. They are: Committees, Rules and Ethics; Housing and Real Estate; License and Real Estate; Police and Fire; and Transportation and Public Way. He is also a member of the National Association of Latino Elected and Appointed Officials (NALEO). REBOYRAS IS involved with several Chicago charities and non-profit organizations. These include the Active Transportation Alliance, Test Positive Aware Network's Ride for AIDS Chicago, the Healthy Streets Campaign, as well as local little league baseball and youth football programs. Reboyras was also the co-founder of the Northwest Youth Basketball Association and “Maraton San-Juan,” an 8K Road Race held in conjunction with the Chicago Puerto Rican Parade. In addition, he serves as the Democratic Party Committeeman of the 30th Ward. ALD. REBOYRAS is one of the hardest working Aldermen in Chicago. He is committed to education, community and safety. MEXICAN DANCERS: Henry Roa, Director of the Mexican Folkloric Dance Company of Chicago announced that they are accepting beginners and experienced dancers ages 6 to 12 at 6 p.m. on Tuesday at Gage Park, 2411 W. 55th St. and Thursday at Piotrowski Park, 4247 W. 31st St. in Little Village.